There is a certain portion of the political and media class who are occasionally so infatuated with their own sense realpolitik that they forget basic truths. What has happened in Iran over the past few weeks is startling. An largely apathetic and cynical electorate re-engaged with politics when two things happened. The hand-picked presidential candidates had a series of sharply contested, substantive debates on television and a large number of young Iranians actively worked on campaigns. There was a record turn-out, with over 85% participation in the vote. People stood for hours in lines because they thought their votes mattered and the issues at stake were important. Whatever we think of the various contenders and the amount of daylight between their positions, we must not lose sight of the fact that people thought their votes mattered and expect them to be counted. As independent observers who believe that the state’s authority depends on the consent of the governed, we must stand with the electorate and their expectation that the voting process is fair and transparent. As things stand today, it is clear the vote and the counting of ballots was neither. The Ministry of the Interior is responsible for administering elections in Iran and there were a number of problems with the vote itself. Many polling locations were short of ballots, opposition candidate supporters were denied credentials to observe balloting, communication media are being jammedand opposition campaigns were disrupted by security forces on election day. There is a strong possibility the ballot counting process was subverted. The results were announced very quickly, the results do not conform with polls taken earlier in the week, the entire state apparatus was brought to bear on the opposition to deny them an opportunity to protest. On a more basic level, you do not see 85% turnouts and high levels of interest when people are happy with the status-quot. You see high turnouts when the electorate wants change. Despite intimidation by paramilitary forces loyal to the current regime, Iranian citizens have taken to the streets in protest. We must stand with them on the side of fair and transparent elections. It is condescending and hypocritical to suggest that a subversion of elections is acceptable to maintain civil order. The error lies with the regime and its attempt to deny the people their right to a free and fair election. 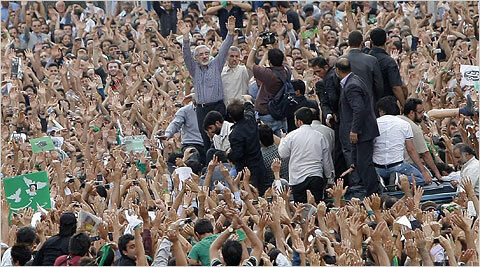 The people are not in error to demand their right under the Iranian constitution to a free and fair election. Commentators who suggest tampering with election results is acceptable seem to have forgotten that long-term stability and civil order exist only when the people know they have a say in their own destiny. It is relatively easy to imagine what will happen unless there is an investigation and the Iranian population concurs that the result is fair. A certain portion of the population will be radicalized and take up armed protest, a far larger portion will return to their former apathy. This scenario is not in anyone’s interest except the current regime’s coterie and is certainly not in Iran’s long-term interest.